I just purchased a 1999 LS400 with 300.000 km on the clock. Runs super smooth but the timing belt and valves were not done in the last 150.000 km's so I decided to do it myself. I have all the tools so I ordered a complete set. Timing belt, water pump, Tensioner, tensioner and idler bearings and camshaft seals. Well.. Now I type this number in google and I find no information or offers. Then I looked in the rockauto database and look for the correct oil seal. Well.. This is where the confusion started.. 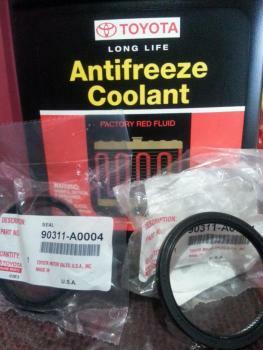 I go to my 1999-ls400-4.0l-engine-camshaft seal. Here I find many seals that look like they are correct. But also they all have different sizes..
Now the weird thing is that when the sizes are given all these seals are only 50mm outer diameter according to the database information. Some of them have no size information. When looking simply in the google and ebay ads that pop up when typing lexus ls400 1999 camshaft oil seal the most common article number I find is: 9031171002. But when I check the interchange information this seal is only 50mm in diameter!! Well. After checking all the yoyopart and kakapart database on interchangeable oil seals the only seals that I find all have 50mm outer 38 inner diameter according to these website. Also i find the SKF 14707 and SKF 14713 As a interchangeable part.. Also this part has a 50mm outer diameter according to that website.. So its not the part I need. I now spend the last 2 days looking at the part numbers and checking the sizes of them and the proper seal can not be found for sale as far as I can see. So or I have become crazy. Or all the sizes given with the seal numbers are wrong.. Wich one is true? Well. 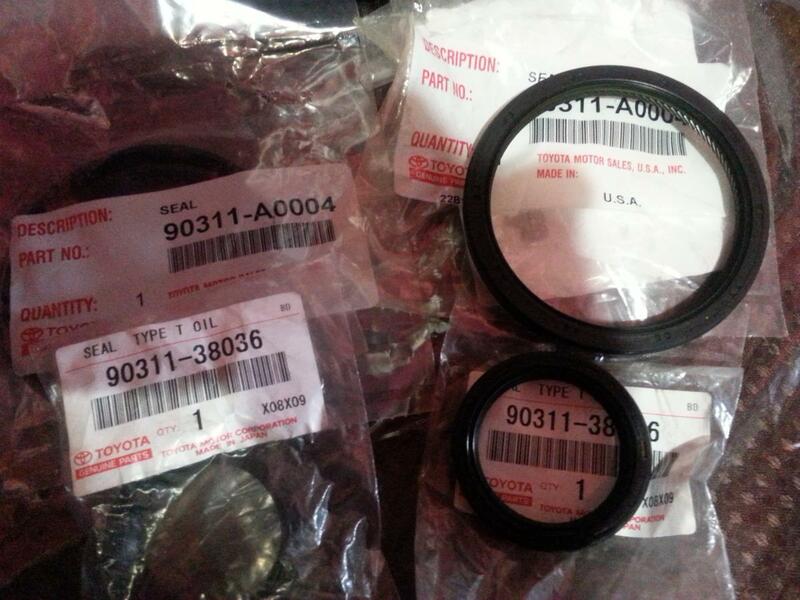 Since I can nowhere find the real proper partnumber of the correct oil seal I have no idea what I should order.. Anyone have the correct number or lexus part no for the oil seal that goes around the VVTi unit in the 1uz-fe VVTi engine?? And if possible alternative brands and part numbers that will fit. If there is a SKF number for this seal I would be very happy as well. I hope anyone knows exactly what I need and found a way through all the seal numbers.. The Toyota DIY site shows part# 90311-71001 for the cam seal. A quick search reveals a few sources but as to exact size, I do not know. Take a look at this and see if it might be a possibility. You do know that you have to remove the cams to get to the seal? You are going to find out that some parts books other than the dealer ones are goofed up on some parts for these cars. The cost dealer seals will not break the bank. That is where I would go if your local auto parts store can't find some. Forget all the online stuff when you are stuck. Rock auto is good but if there was a goof up with not so costly parts like a seal, then go in person some place and show them in person what the problem is. 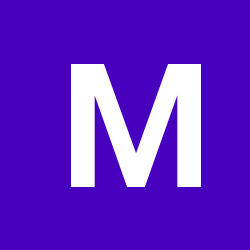 So much less hassle than dealing with something you can't see online. Yes I have the complete cams already removed. Reason is that I had to set the valves. It was really really time.. I only had 0.05mm play at some of my exhaust ports. I hope there is no damage already done. It ran sweet and strong so I hope i am just in time. I also have to screw of the VVTI unit to be able to change the seal I see. It will not get on from the back. Anyways. The part number you gave me is a number I have also found. Just stupid thing is I can nowhere find the sizes that this seal should have.. And according to the kakapart list it is interchangeable with seals that are only 50mm in diameter.. Maybe that Kakaparts website is totally *BLEEP*ed up with its interchangeable list... Maybe that is what causes my doubts..
Wow! a new number again! I am slowly getting crazy.. So now I need 90311-71001 or 90311-71002 or now a new number 90311-A0004. Whahahahaha.. Wich one is best?? Are they all the same?? Is this seal the same for the LS400 VVTi and LS430?? Seems like no one has the seal here in the netherlands except for the dealer. And the dealer dares to ask 51 euro for one seal!!!! I would say let them die.... Thats why I tend to find out the right part no so I can order online. But still I get more and more numbers.. The 90311-A0004 that you now give me. Was this one fitted to a LS400 with VVTi? or a later model? Wow! It gets better. Just called a different Toyota dealer her in my area. After looking into his computer he gave me a new number!! Whahahahahahahahaha!! The world of Toyota and Lexus parts is getting completely rediculous and Crazy. I now got the number 90311-95012 ;-) We keep saving numbers. But I really think this dealer was drunk..
Well I'm going with the ones I posted since I changed them myself back in May. I got them from the lexus dealer. That 90311-71001 is cross referenced with 90311-A0004 on the lexus site. The 90311-95012 is a part number for a rear crankshaft seal so I would ignore it. The 90311-71002 seal is for later year vehicles. Mainly the 4.3L and 4.7L engines. Ok.. It sounds logically. Although the dealer here told me the 71002 is the same as the 71001. He told me they just updated the numbers. . So that would mean they are all correct exept the 95012. Wich I already knew can never be the correct one.. Well. If you are sure it works on your vehicle.. Its unfortunate the A0004 is nowhere for sale here in the netherlands. Ill have to order it online then and wait a !Removed! 10 days or so..
Gosh a friend in US could have sent you a gift, that's a horrible high price. I wonder what the sewell price would be here? Well. I did like to order in the us for around 15 dollar each but ill have to wait an other 10 days untill I get it here. I have time this week to finish my car and no time after the weekends. I surely wished I could buy here locally from different brand and dealership for a normal price but the seal really is not available outside the dealership. They have the monopoly so it seems so thats why they just do.. The Netherlands is not like the US. We are not protected from monopoly positions. Unfortunately.. Now you understand why I was desperately trying to find the alternative part numbers for the right seal. And even though I found quite a lot of them. They were all not available at this moment..... This is europe.. Down the drain I would say..
Wow that is crazy! I saw rockauto had a beck/Arnley with the same part number but I don't know if they ship to your area. I never saw anything saying where you were at. I thought it was US. Any future LS projects try to plan ahead and order from US. Amazon also has compatible seals. When I got mine I did not know what was compatible so I did not want to take a chance but after I got them from the dealer I knew I could of saved some money and went with the amazon seals. I did check Amazon too. Unfortunately all suppliers on amazon were also positioned in the US. So no option if you need them quickly. Anyways. Thanx everyone for thinking along. Unfortulately none of the part numbers are for sale in the netherlands for a normal Price. I thought Amazon had a UK store. Probably yes. But the offer for the seal is on the US side of amazon. Ok make sure you seat the seals correctly and pay attention to the front bearing caps to make sure they are not leaking. Those are supposed to be cleaned and new FIPG is supposed to be applied.